Previously on Orange Is The New Black, Achilles Goss' Lorient returned to Ligue 1 at the first attempt. The Achilles Goss promotion parade! Survival plans after gaining promotion. I have seen a lot of people write about them. Create a matrix of fixtures they expect points from in order to prioritise those games, overhaul the playing staff, change up tactically to be more defensive; all effective in the pursuit of beating the drop. But Achilles Goss really didn't do much at all…yet his Lorient side somehow finds itself 8th in Ligue 1 going into the 2019/20 Winter Break. But what he did do was trust the team, and the system, that saw Lorient promoted. Perhaps trusting an evolution, rather than revolution, which is what I will be writing about today. Trust [noun]: firm belief in the reliability, truth, or ability of someone or something. Regular followers/readers will know that last season was a struggle to get out of Ligue 2, and we took the hardest route possible. But despite the ups and downs, the team achieved it…culminating in the Ligue 1 Promotion Play Off against higher opposition Dijon FCO. Despite only winning 2-1 on aggregate, these two matches showed that we were up to the standard of Ligue 1 and I shouldn't panic going into the season. Instead, I should polish around the edges of my 1st team and then review what I need for 2020 and beyond. The key performers from 2018/19: Cabot, Courtet, Fonsinho, Lemoine & Le Goff. On reflection it was a decent pre-season and I made some subtle tweaks to my 4141 (see below). I'm enjoying the interchanging of my central midfield, Younousse Sankharé particularly excelling as the Box-to-Box mid. He arrived on an 18-month loan deal in January 2019 from Bordeaux and took 6 months before he finally started to look like a good player. Alongside him are new arrivals, again both at no immediate transfer cost to Lorient: utility midfielder Alexis Blin (a season long loan from Toulouse) and aggressive ball winner Victorien Angban (a Free Transfer from Chelsea). All three complement Fabien Lemoine well, who is our primary playmaker (DLP-D) and club captain. The Dutch South American Football Expert that posted this will remain nameless, in order to protect his identity. The final signing was a controversial one (if my Slack channel is led to believe), Christophe Jallet joined from Nice for €97k. It divided opinion, perhaps people always like the younger players…but there is something about the experienced head that I trust. Christophe is 35 years of age and has played out his career entirely in France. Furthermore, he knows Lorient well (having played there between 2006-2009). He'd be my 1st choice at Right Back, as I missed out on top targets Milan Gajic and Valentin Rosier who rejected my contracts. Current Right Backs Jonathan Martins Pereira & Houboulang Mendes are continued weak links and will compete for the reserve slot. The playmaking role has been shifted to DM due to Lemoine’s advancing years (and his declining quickness). I have changed him from DLP on Support to Defend, to get him to move less forward and let the younger guys in front of him do most of the running. Central midfield varies between CM-A + BWM and B2B + BWM, dependant on personnel and game situation. Whatever the combo, I am in love with a BWM-S this year…Victorien Angban is joyous to watch. He glides over the pitch like a rabid animal, hunting for his prey in a one-man wolfpack. The Wing Back role in the team has been moved to the left, due to Jallet’s advancing years at right back. Le Goff is usually WB-S or WB-A, and one of our key performers. There’s also a good output to him too in terms of assists, as he bombs forward well. Jallet has been made a standard FB on Support, he is the elder statesman of the team: reliable and steady. 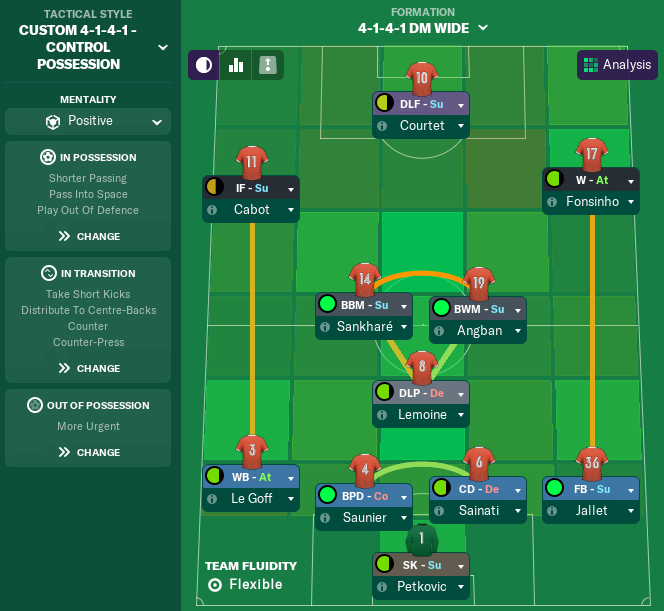 Additionally, I’ll resort to the classic [panic station] 442 with two upfront (AF + DLF) when I am chasing a game in the 2nd half, but I have genuinely used this less in FM19. A great opening month saw us shock everybody, including myself! A 2-0 win against Paris Saint-Germain was the standout result. Although there have been ups and down, we haven’t really looked out of place at all. We’re able to compete well and 31 points at this stage of the season leaves me with hope that survival is a sure thing. I predict that 40 points will see us safe, and until I achieve this tally it will remain my ultimate aim. One delight has been our home form, in front of nine maximum capacity crowds of 17,076 fans: 6 wins, 2 draws and 1 loss. Average attendance by capacity is the league statistic we currently top, and justification for a larger capacity once I have some money in the bank. Fingers crossed I can work some magic in the Transfer Market over the coming years and make my dreams a reality! 100% average attendance by capacity. If only there was a trophy for this at the end of the year! In the opening post to this series I mentioned why my player recruitment would be targeting Africa in FM19. I made a good start in my 1st season, bringing in Left Back Elderson Echiejile (Nigeria) & Winger Fonsinho (Côte d’Ivoire). I have added to this over the last 12 months in-game. In came aforementioned Younousse Sankharé (Senegal) on an 18-month loan deal from Bordeaux and my 2nd Ivorian signing, Victorien Angban (Côte d’Ivoire) from Chelsea - who spent most of his early career being trafficked by that rotten English club. Central midfield now has an African presence in it with these two players: a Box to Box and Ball Winner respectively. Countries recruited from so far: Côte d’Ivoire, Nigeria, Senegal & South Africa. Rivaldo Coetzee in orange. He’ll join us in February after playing in the African Championship of Nations 2020. But the standout January 2020 arrival is Rivaldo Coetzee (South Africa), who many Football Managers will know as a highly gifted Ball Playing Defender with bags of potential. Not only is he rated the best defender by our coaches, he could also fetch me some profit if he proves himself in Europe. There have been a few niggling injuries (I can’t lie, it still worries me), but in terms of injury severity & duration they are relatively minor and what you’d expect from a player coming back from such a big injury. We’ve therefore continued today’s theme of trust and have gone big, Director of Football Christophe Le Roux negotiating a €925k fee with Mamelodi Sundowns. This has however pushed us further into the red, with an overall balance of -€3.5m. Sooner or later I will have to make up some of this money with a player sale or two. Thus begins the 2nd half of 2019/20, a season which has been really enjoyable to play so far. As always, to find out what happens next in Brittany follow me on Twitter (@FM_Grasshopper), on FM Slack (#fmgrasshopper)…or on here for the next post.